I can always count on a certain radio station (which shall remain nameless) to play the same Christmas songs over and over, year after year. But it's not like anyone's putting a gun to my head. They're not all bad - the songs have become more of a seasonal expectation now. And my two favorites being George Michael's "Last Christmas" and Mariah Carey's "All I Want for Christmas is You." So as Mariah Carey sang her heart out in my car today, I explained to my youngest child that she was kind of a big thing when I was in high school. And much to my dismay, my daughter said, "Cool. Is she still alive?" Wow, where did that come from? Am I really at that age where famous singers from "my day" may or may not be alive? Fine. I'll take it. Because the older I get, the more confidence I exude and uninhibited I become. Free to be me, that's what it is. Take our most recent day at Disneyland, for example. My daughter, the same one who thinks it's perfectly natural for "my aged" people to start dying-off, wanted Pluto's autograph. But what to have him write it on? I wasn't ready for this, but Pluto was. He was just standing there. It was surprising how available he was. So off I go, searching into the chaos that is my purse. You could practically hear the Flight of the Bumblebee tune in the background while I go digging. (And it's possible my trying-hard-to-look-for-something tongue was sticking out.) What's Molly going to find? A sock, a bag of almonds, a lipstick cap - and a pen cap. Oh, there's the pen! Frantic that Pluto was about to move-on to a more prepared family, I pulled out an old ATM bank statement - aka: versateller statement. (Am I right or am I right?) Of course, it was crumpled. But once I smoothed it out on my leg, I said, "Here you go, PLUTO. Sign the back of this!" Realizing how unconventional and "Frankie Heck" my display was, I felt a little judged by onlookers. "Oh dear, that poor woman has no filter." 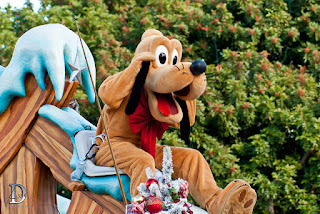 So I quickly called myself out and made a joke of it, telling Pluto to resist peeking at the other side and stuff. And Pluto did his whole hands-on-his-head-moving-back-and-forth thing. As in, "I can't believe I turned down a job at The Gap for this." I went from carefree and confident to "oh my gosh, everyone thinks I live in a van down by the river" in 2.4 seconds. Good thing God didn't make fun of me. Or if he had, it'd be more of a laugh-with-me-not-at-me sort of thing. He knows I don't live down by the river - and wouldn't look down on me if I did. And that's the thing: God doesn't look down on me. John 3:17 says, "For God did not send his Son into the world to condemn the world, but to save the world through him." Such a Christmassy verse, for it shows that Jesus came into the world to extend grace and mercy to us. What a confidence builder, too, despite my unsophisticated autograph-getting tactics.